The duchess was a global ambassador for World Vision, the international children’s charity, from 2016 – 2017. 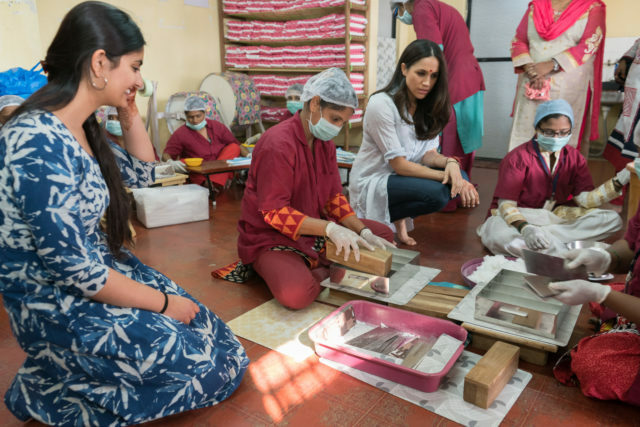 Meghan, who is due to give birth in the coming weeks, is shown during her trip to New Dehli where she highlighted the plight of girls whose education suffers when they are menstruating. The video, filmed during the January 2017 visit, shows her planting flowers and painting signs with girls at a school where World Vision installed clean water and sanitation facilities. When she returned, she wrote a piece for Time Magazine about her experiences and said: “I travelled to Delhi and Mumbai this January with World Vision to meet girls and women directly impacted by the stigmatisation of menstrual health and to learn how it hinders girls’ education. The visit came at the start of a year that would end with Harry and Meghan announcing their engagement and marrying a few months later in 2018.